During the hour-long discussion, Mr Chan also cited the example of the Suzhou Industrial Park project, jointly developed by China and Singapore in the 1990s. What was more important than the physical structures of the industrial park was the intangible "software transfer" that took place behind the scenes. The number of delegations that came to Singapore to learn about the system, and the number of delegations from Singapore that went to China to help build the project and transfer the software was as important as the park that was built. These were critical in ensuring the success of the project, and to replicating it elsewhere afterwards, he said. Singapore, he added, had to work closely with its partners on the ground and consult them on what was needed at different stages of China's development, so that Singapore's efforts could continue to be relevant and add value to China. After the industrial park development of the 1990s, Singapore moved on to focus on addressing China's growing environmental and sustainability concerns in the Tianjin Ecocity. By 2010, China had again moved on, and Singapore sought to be helpful by working with it to unleash the potential of its inland western region, to balance off the previous focus on development in the coastal areas. To do so, Singapore worked with its Chinese partners to find practical ways to lower the financing and logistics costs of operating in these inland areas so as to make them more economically competitive and attractive to investors, he said. Making a similar point, AIIB's Mr Jin said the bank sought to deliver projects that not only were sustainable both economically and environmentally, but also had the support of the local community. It strived to avoid the "malaise", often associated with public sector projects, of building white elephants that were more about "showing how wonderful politicians were" or building "giant toys" for them that did not benefit the community. This was possible only through projects which had "broad consultation, joint construction and shared benefits", he said, citing a phrase often used by Mr Xi. Mr Abbasi outlined the various infrastructure projects that China and his country had embarked on under the China-Pakistan economic corridor. These, he said, were a good way to help realise the vision for an "inclusive" global order that Mr Xi had spoken of in Davos. Concluding, Mr Chan likened the work on the BRI to that of a bricklayer. His effort could be described as simply setting down a brick or, alternatively, as part of an effort to build a wall. But from another perspective, that same effort could be viewed as part of a longer term vision to build a cathedral, he said. Mr Chan added he believed that China's leaders had the wisdom to view the BRI as a contribution to building an inclusive global order that benefits the world in the long run. It has been touted as one of the most ambitious plans of the 21st century so far. 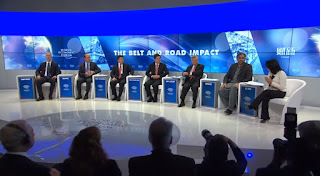 China's Belt and Road Initiative has not only gained attention because it spans Asia, Africa and Europe and covers 60 per cent of the world's population, but also because the participating countries cover around a third of the world's gross domestic product and world trade. They also contain 60 per cent of the world's population. Claire Huang looks at how it could help Singapore businesses and whether it will live up to its hype. 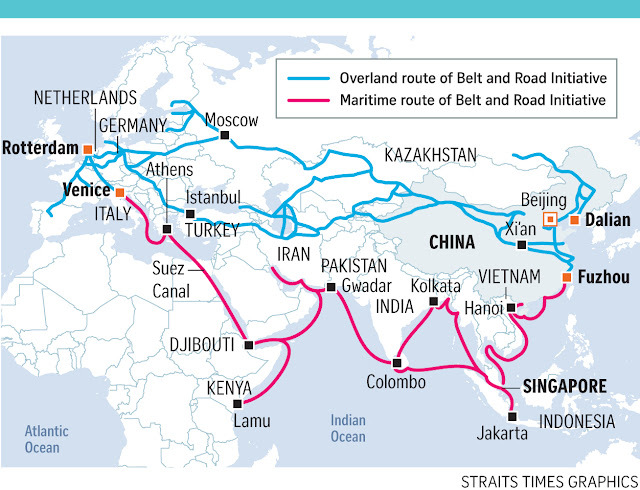 Unveiled in late 2013, the Belt and Road Initiative (BRI) - formerly known as One Belt, One Road - is Chinese President Xi Jinping's signature foreign and economic policy initiative. It seeks to place China at the centre of the global trade network by recreating ancient trade routes - now billed as the Silk Road Economic Belt and a 21st Century Maritime Silk Road - across Asia, Africa and Europe. The BRI is expected to attract trillions of dollars in infrastructure spending in 60 countries by connecting Asia, Africa and Europe over land through Europe-Asia continental roads, and sea routes through the South China Sea and Indian Ocean. This will be achieved through the use of rail, roads, waterways, airways, pipelines and information highways. By the end of last year, almost US$50 billion (S$68 billion) had been invested in economies along the BRI routes. Western banks are now in a race to fund BRI projects, the Financial Times has reported. So far, the Asian Infrastructure Investment Bank has given an initial capital of US$100 billion. China has also begun financing a power distribution upgrade in Bangladesh, rail networks in Indonesia, Africa and Laos, as well as maritime infrastructure in Pakistan and Oman. At maturity, investment in the BRI is expected to reach US$4 trillion. But it has not all been smooth sailing. In early December, Pakistan, Nepal and Myanmar backed out of three major hydroelectricity projects, worth some US$20 billion in total, planned by Chinese companies. What role does Singapore play? Singapore has been China's largest foreign investor since 2013 and was one of China's top trading partners in Asean in 2016. From 2013 to 2016, Chinese investments related to the BRI reached US$60 billion. Singapore is one of the top recipients of China's outward BRI investments, receiving around a third of them since 2015, while 85 per cent of China's inbound investments from BRI countries make their way into China through Singapore. In September last year, Mr Xi and Prime Minister Lee Hsien Loong reaffirmed the three platforms of collaboration under the BRI - infrastructural connectivity, financial connectivity and third-country collaboration, such as joint training for officials from BRI countries. BMI Research infrastructure analyst Christian Zhang says that many BRI countries have underdeveloped regulatory, legal and financial systems, so organisations will look to Hong Kong and Singapore as stable, low-risk "middle grounds" for forging such deals. "The two economies are already home to many international contractors, consultants and financiers, reinforcing the advantages offered by their strategic location along the routes," he said. The key areas of investment opportunities are in infrastructure, transport, finance, insurance, trade, professional services, e-commerce, technology and innovation. Singapore companies have been actively pursuing BRI opportunities in sectors such as real estate development, energy, shipping and logistics, as well as publications and new media. These include the joint venture in 2015 between Ascendas-Singbridge and China Machinery Engineering Corporation in industrial and business park investments and developments across Asia, and the agreement between Sembcorp Industries and Chongqing Energy Investment Group to work on areas such as renewable energy projects, township development and overseas energy projects. International Enterprise (IE) Singapore and the Singapore Business Federation have also been matching local firms with Chinese partners and other interested parties. Singapore is the largest clearing centre for Chinese yuan payments outside of China and Hong Kong, and IE Singapore signed BRI agreements with major Chinese banks to increase financing and Chinese partnership options for local companies. 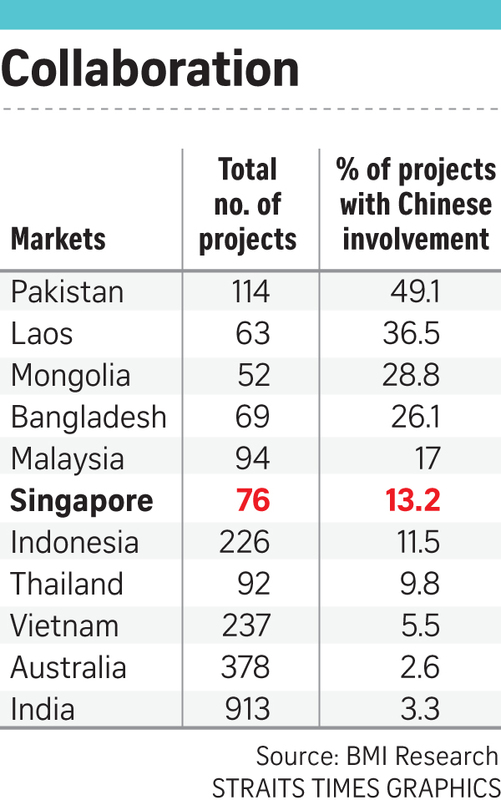 IE Singapore also established connections with multilateral Chinese financial institutions to help Singapore companies tap the available funding, regardless of size and project value. 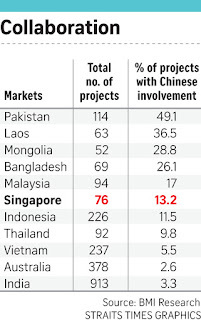 These financial institutions are mandated to provide funding support for BRI projects. Observers note that the success of the BRI in areas such as Central Asia and Russia is not guaranteed. Beyond the specific difficulties in these regions, China also has to work with countries which have been less than enthusiastic about the BRI, such as India and Japan. There are also strings attached to receiving development help from China. Last December, Sri Lanka formally handed over its strategic port of Hambantota to China in order to reduce its debt to Chinese firms that have invested billions into port and maritime infrastructure there. There is a growing realisation among poorer countries that Chinese proposals to build infrastructure come at a high price. In addition, China has been an active communicator of reforms and of opening up its economy to the world. But critics have dismissed this as rhetoric, pointing to China's foreign direct investment (FDI) policies. They argue that reciprocity is a key to BRI's success. Last year, Chinese outward FDI amounted to US$111 billion - about four times higher than in 2012. However, inward FDI into China stood at US$40 billion (excluding investments from Hong Kong) - a wide disparity and a sign that China has much room for improvement to allow outsiders greater access. This has led to countries like the United States and members of the European Union pushing for greater reciprocity on this front. Innovation will be at the heart of ASEAN's next phase of development, Deputy Prime Minister Tharman Shanmugaratnam said on Wednesday, as he outlined several areas of priority, including fintech and e-commerce, for the regional grouping. He was delivering the opening remarks on the strategic outlook for ASEAN, which Singapore chairs this year, at a session at the World Economic Forum in Davos, Switzerland. DPM Tharman told an audience of business and political leaders that despite challenges such as a shifting geostrategic balance, uncertainties over trade and globalisation, cyber security and terrorism, there are huge opportunities for ASEAN. "The shift in economic balance globally is playing to ASEAN's favour. The rise of China and India is a huge opportunity for ASEAN, and in particular the Belt and Road Initiative has ASEAN as a core part of that initiative - I would say an anchor along the initiative," he said. Home to about 639 million people, ASEAN is now the world's seventh largest economy and is projected to become its fifth largest by 2020. Singapore assumed the rotating chairmanship of ASEAN this month, and DPM Tharman said its main emphasis will be to build resilience to cyber security threats and terrorism, and push the innovation agenda. While ASEAN is still a major commodity exporter, with highly competitive export manufacturing, and an attractive market for goods and services, innovation is now "being breathed into all the existing dimensions of economic activities", he said. Areas that could be developed include the use of financial technology, digital payment systems, e-commerce, developing smart cities and getting youth interested in innovation, DPM Tharman added. The use of fintech has huge potential as ASEAN is a diverse region with "large under-served populations without banking accounts" and inadequate access to financial services. DPM Tharman also mentioned a goal to link digital payment systems across ASEAN, pointing out that experiments are under way. "Thailand and Singapore have just started detailed discussions on linking up our payment systems so that with just mobile phone numbers, you can make payments across countries. We intend to spread that around ASEAN," he said. In the area of e-commerce, the goal is to develop trade rules to lower costs for consumers and improve access for businesses. ASEAN also intends to designate smart cities across the region, and will work with the private sector to develop them. Finally, DPM Tharman pointed out that these efforts will not be executed by just "sagely experts or high-level government people - youth will also have a part to play. "We intend to involve the youth, especially. Developing a workforce that is very comfortable with innovation, that feels innovation gives them advantage, is going to be critical," he said. DPM Tharman's remarks were followed by a panel discussion on the topic. Panellists included Vietnam's Deputy Prime Minister Vuong Dinh Hue and corporate leaders such as CIMB Group Holdings chairman Nazir Razak. The discussion was moderated by former Indonesian trade minister Mari Elka Pangestu.